The IZA Journal of Labor and Development and IZA Journal of Migration have merged to form the IZA Journal of Development and Migration. View articles here. Archives of the two separate journals are here. - Mix of articles, including several on Syrian refugees. - Special issue on "The Urbanization of Humanitarian Crises." The editorial is freely available and four articles are Open Access. - "We begin this issue with an overview paper by Leo Lucassen on the contemporary 'refugee crisis' from a global perspective. ...The next paper is by Thomas Faist and is connected to the issues addressed by Lucassen. It is focused on the moral polity of forced migration and given the topicality of the issues it addresses, we invited contributions to a Symposium on the paper by leading scholars in the field of migration." The introduction, overview paper and Symposium paper are all freely available. - Theme issue on "Réfugiés et migrants au Liban." - Special issue on "Aid Localisation." 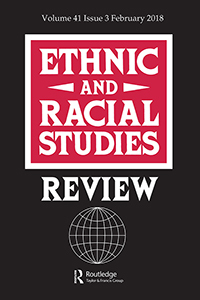 - "The centerpiece of our new issue is an exciting dossier on contemporary refugee timespaces... ."
- Special issue on "Identity, belonging and education for young people from refugee and asylum-seeker background." The editorial is freely available. - News and information for refugee legal aid providers.